You’ll be swept ashore at Awāwamalu. The life from the parents will be broken off. When you sailed yesterday, it was calm. This coastline is called Ka Iwi; it fronts Ka Iwi Channel. 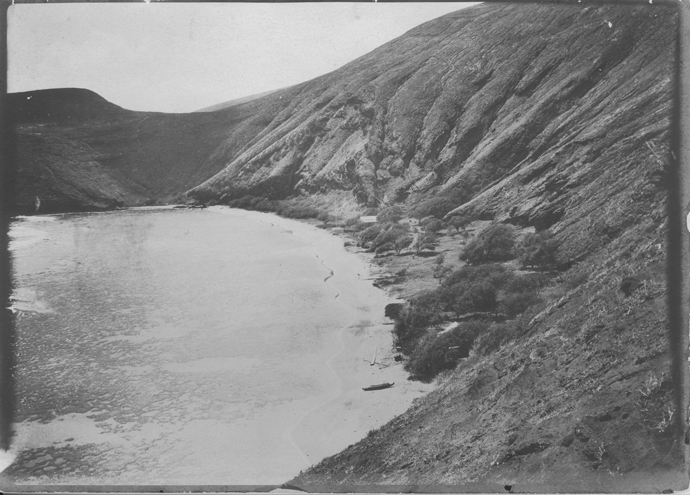 It may have been named for the bones of lost travelers who failed to make the crossing between Molokai and Oʻahu. Others suggest it may be because the raw, wild, volcanic landscape of the area, rising from the sea, reminded the ancients of the exposed bones of the earth. Wind speeds decrease in the lee of each island; whereas winds in the channel increase in strength. The area out in the channel is subject to heavy, gusty trade winds. In Hawaiian tradition, Lāʻau Point on Molokai represents a point of no return. For those traveling by canoe from Oʻahu to Molokai across the Kaiwi Channel, once Lāʻau Point is sighted, there is no turning back to Oʻahu. More commonly known today as the Molokai Channel, the Kaiwi Channel separates the islands of Molokai and Oʻahu; it has the reputation as one of the world’s most treacherous bodies of water. The channel is about the length of a marathon (26.2-miles) but it’s a body of water; annually, swimmers, paddlers and others seek to cross its span as an individual achievement, or the glory of participating/winning a race. In 1939, William K Pai is reportedly the first person to swim the Kaiwi Channel, from ʻIlio Point on Molokai to the Blowhole near Oʻahu’s Sandy Beach (because he first paddled a little offshore before swimming, it was ‘uncertified.’) Since then, several others have tried and succeeded. On October 12, 1952, three Koa outrigger canoes launched from Molokai’s west side; nearly nine hours later, Kukui O Lanikaula landed on the beach at Waikīkī in front of the Moana Hotel. Thus began the world’s most prestigious outrigger canoe race, the Molokaʻi Hoe. Two years later, the women’s Na Wahine O Ke Kai, Molokai to Oʻahu Canoe Race, was inaugurated. In the early morning of March 18, 1978, the Coast Guard arrived to assist the Hokuleʻa; later that day, they sighted Aikau’s surfboard. Eddie was never seen again. 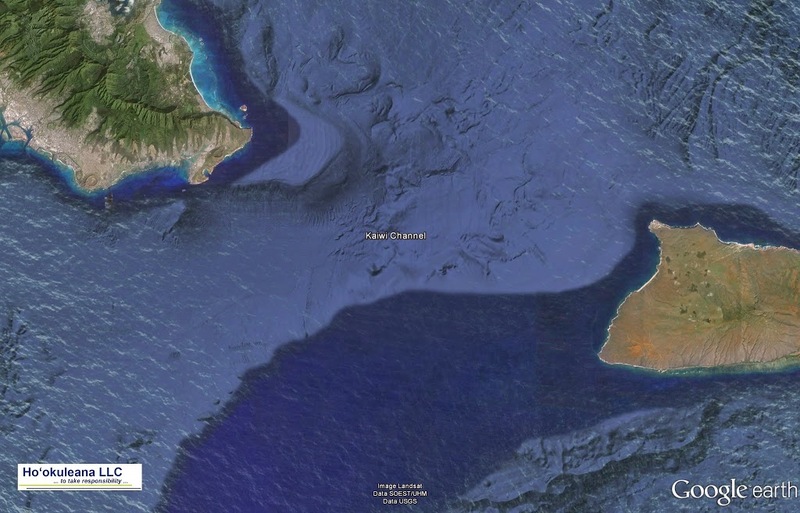 The image shows a Google Earth image of Kaiwi Channel. In addition, I have added related images in a folder of like name in the Photos section on my Facebook and Google+ pages.